Disclaimer: I did receive this item for free in exchange for my honest review. All opinions are my own. There are also links to products I recommend from companies I have a referral relationship with. I will be compensated if you make a purchase after clicking on my links. 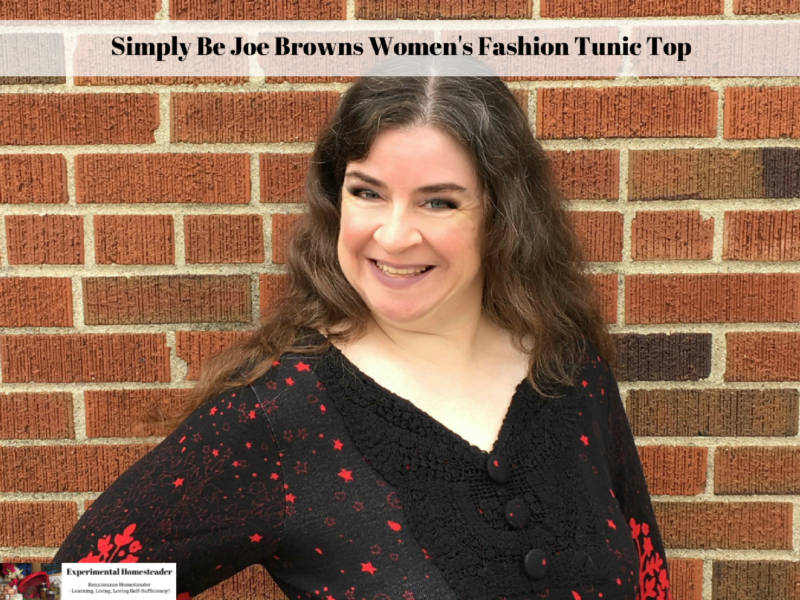 When I saw this women’s fashion tunic top designed by Joe Browns on the Simply Be website I knew I had to have it. A tunic top is a lot longer than a regular t-shirt or blouse – and I love that. After my twins were born I had a bit of a stomach – and sometimes regular shirts are just too short for me to feel comfortable in. This tunic top is more like a short dress and it almost reaches my knees. I am 5′ 1″ so if you are taller this is going to be shorter on you. The 100% cotton crochet false collar is fantastic – and I love the large buttons covered with fabric that matches the rest of the tunic. The material is stretchy which is no surprise given it is made up of 96% polyester and 4% elastane. I love the red and black design. I also love that the tunic has long sleeves yet is breathable enough that I can comfortably wear it on mild fall days without feeling like what I have on is too warm. I chose to pair this women’s fashion tunic top with jeans – just because that is what I am most comfortable in. This particular tunic top from Joe Browns would pair well with leggings, dress pants, leather pants or even a skirt. It is definitely one of those versatile pieces of clothing that you need in your wardrobe. For women who travel often, this is the perfect tunic to take with you because of its versatility. When you order online it’s hard to know if the clothing you are getting is well made. I am happy to say this tunic top is well made with no loose threads, no tears and it came out of the package ready-to-wear. I did wash it before I wore it – and it is an item that needs hand washed, but many clothes today are like that especially some of the nicer ones like this tunic top. I anticipate that this tunic top is going to last for years as long as I take proper care of it and follow the care instructions that were sewn into the side seam. While I don’t consider myself a plus size, I do sizing charts have changed – and this particular tunic top is a size 8 which is now considered a plus size. Simply Be has plus size dresses, tops, bottoms plus footwear and accessories, so you can get everything you need to rock an outfit on one site. I love clothing that is unusual after all I sure don’t want to wear the same outfit as ten other people. I was really impressed with some of their designer clothing because it was unique. The night I chose the tunic top in the photo there was plenty of them available but by the time I received a response they were down to size 8 only and by the time it arrived, they were sold out, so don’t hesitate to order if you love what you see! Be sure to check the site often to see what’s new as well because if you are like me you don’t want to miss out on that one unique item that takes your wardrobe from ordinary to head turning!